If I had to point to any one author that influenced my early years of science fiction, there's no contest: Isaac Asimov is it. I practically lived in my high school library, which was well stocked with a wide range of Asimov stories. I distinctly remember borrowing, reading and re-reading I, Robot, and scouring anthologies for other stories of his. As a result, I've always had a fascination and appreciation for Asimov's works. He's certainly not without his flaws: reading Caves of Steel for the first time now reveals much about his writing style. But, it lends itself to a certain charm. When I covered John W. Campbell, I knew it would be a matter of time before I reached Asimov, and looking at his career through his Three Laws of Robotics proved to be an excellent trip down memory lane. Caves of Steel, Isaac Asimov: I purchased an omnibus copy of Caves of Steel and The Naked Sun at Boskone recently, and I've been reading through it, enjoying it. I wish that I'd picked it up as a teenager: I think I would have enjoyed it then, but I'm certainly enjoying it now. 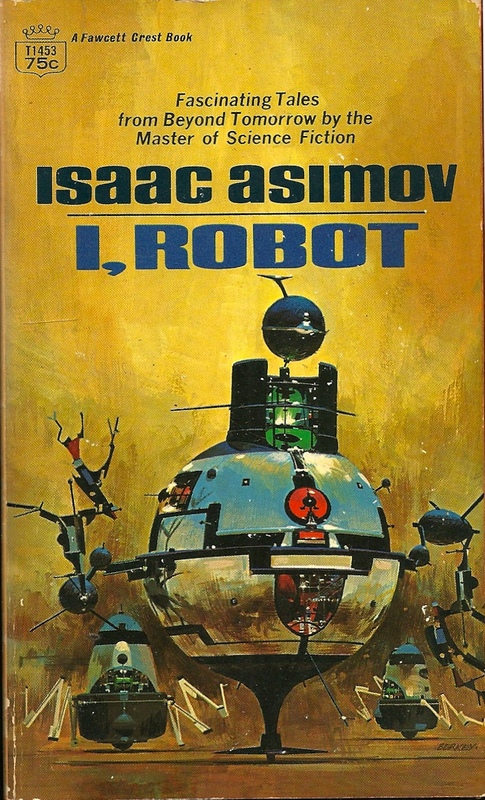 I, Robot, Isaac Asimov: One thing that I hadn't realized when I first read the book was that the stories had been edited and fixed up a bit to fit into a single story, composed of a bunch of short stories. This was helpful while I worked on piecing together the timeline of Asimov's Robot stories. It's Been A Good Life, Isaac Asimov: A condensed version of Isaac Asimov's 3 volume autobiography. I read this years ago, and re-reading it now, all that I can say is: holy hell, that man has an ego. This particular book isn't all that useful: it's edited down and very brief. I'll need to look up his longer work before I do more with him. Robot Visions, Isaac Asimov: This collection of Robot stories contains a favored story: The Bicentennial Man. I might be one of the only people to enjoy the film, and the story is fantastic. This particular volume is helpful for its introduction. Survey of Science Fiction Literature, vol 1 & 2, Frank Magill: Magill has come through time and time again, this time, for the entries on I, Robot and Caves of Steel. The entries aren't as helpful as some of the others, but they do shed some good light on the subject. Brave New Worlds, Jeff Prucher: This wonderful book is a dictionary of science fiction words, and was helpful when it came to looking up the roots of the words for Robot and Robotics. The History of Science Fiction, Adam Roberts: Roberts has a fantastic section on Asimov, split between his Foundation and Robot series, with a good look at the philosophy behind the stories.